Butequine is a synthetic, non-steroidal anti-inflammatory, antipyretic compound useful in the management of inflammatory conditions. The apparent analgesic effect is probably related mainly to the compound's anti-inflammatory properties. Chemically, Butequine is 4-butyl-1, 2-diphenyl-3, 5-pyrazoliolinedione. It is a pyrazolone derivative, entirely unrelated to the steroid hormones. CONTRAINDICATIONS: Use with caution in patients who have a history of drug allergy. PRECAUTIONS: Stop medication at the first sign of gastrointestinal upset, jaundice, or blood dyscrasia. Authenticated cases of agranulocytosis associated with the drug have occurred in man; fatal reactions, although rare, have been reported in dogs after long-term therapy. To guard against this possibility, conduct routine blood counts at weekly intervals during the early phase of therapy and at intervals of two weeks thereafter. Any significant fall in the total white count, relative decrease in granulocytes, or black or tarry stools, should be regarded as a signal for immediate cessation of therapy and institution of appropriate counter measures. In the treatment of inflammatory conditions associated with infections, specific anti-infective therapy is required. ADMINISTRATION AND DOSAGE: Orally - 1 to 2 g of phenylbutazone per 500 lb. of body weight daily. Do not exceed 4 g daily. Guidelines to Successful Therapy: Use a relatively high dose for the first 48 hours, then reduce gradually to a maintenance dose. Maintain lowest dose capable of producing desired clinical response. Response to Butequine therapy is prompt, usually occurring within 24 hours. If no significant clinical effect is evident after five days, re-evaluate diagnosis and therapeutic approach. 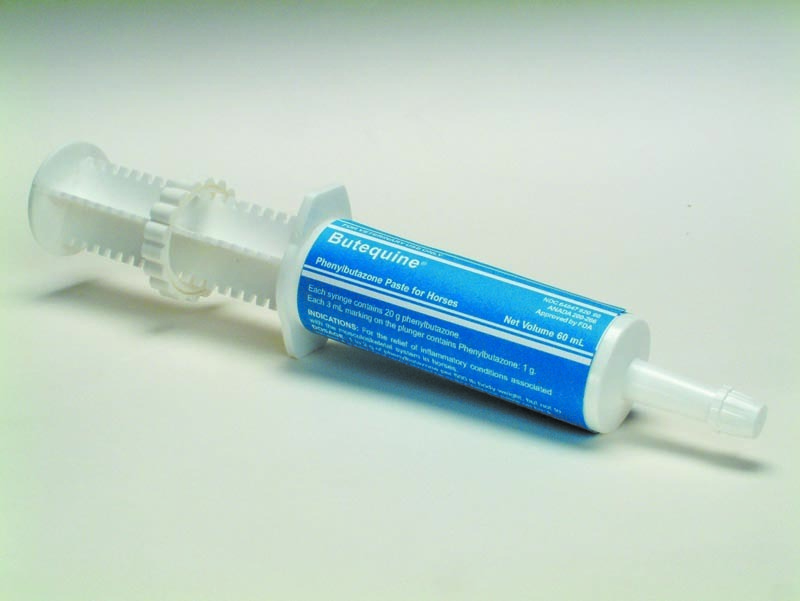 When administering Butequine, the oral cavity should be empty. Deposit paste on back of tongue by depressing plunger that has been previously set to deliver the correct dose. Many chronic conditions will respond to Butequine therapy, but discontinuance of treatment may result in reoccurrence of symptoms. STORAGE: Store at 15°-30°C (59°-86°F).